Stephan Fort�'s Adagio has been blazing a new path ever since 2005's Dominate. 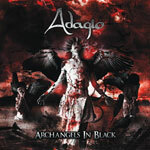 Adagio has been integrating attributes of extreme metal in their music including the heavier, harsher riffs and dirty, gruff vocals more akin to melodic death metal. Archangels In Black continues this progression in style. Fortunately, Forte is a skilled and thoughtful composer. He makes this transition work well and avoids the excesses found when others have attempted this merger. Clear vocals are not abandoned and the underlying foundation for the songs is still traditional progressive metal. This direction works so well for Forte and Adagio that I would consider the best songs on Archangels In Black to be the ones that follow this format. Coming from me, one who despises most dirty vocals and thinks melodic death metal is generally oxymoronic and too commercially ubiquitous to be viable, is a huge statement. However, 'Undead' and 'Twilight At Dawn' are sterling examples of how well Adagio has merged extreme components into their arrangements. For example, the latter begins much like power metal with a melodic death metal motif. Yet later in the song it veers towards melodic progressive metal in the lead guitar and keyboard work. Other notable pieces that combine the heaviness of extreme metal with the sublime of melodic prog are 'Vamphyri' and 'Fear Circus.' Again, Forte and company do this quite well. With this said, where Adagio excels, and intrigues me the most, is when they pursue traditional heavy progressive metal as on 'Codex Oscura.' This is a formidable and creative composition with varied movements that display the depth of Adagio's corporate talent. On the other hand, there are some dull moments on Archangels In Black . Specifically 'The Fifth Ankh' and 'Getsu Senshi' rumble along with an average power metal foundation and the abbreviated death vocals sound more like an afterthought than a true part of the song. Only Forte's fret work can save these. On Archangels In Black Stephan Fort� and Adagio continue their exploration and addition of extreme metal components into their progressive metal. In less capable hands this would be an immense failure. However, Adagio pulls it off with creative, challenging and immensely entertaining results. Very recommended! On Archangels In Black Stephan Fort� and Adagio continue their exploration and addition of extreme metal components into their progressive metal. In less capable hands this would be an immense failure. However, Adagio pulls it off with creative, challenging and immensely entertaining results.